Food and beverage companies today face shifting customer demand, tight margins and a competitive market. Further complicating matters, manufacturers must meet growing demand using existing assets as capital expenditures constraints limit investment in new equipment. In order to stay competitive in today’s market, manufacturers need to maximize their economic return on assets. One particular aspect of digital transformation that holds great promise for food and beverage companies is predictive maintenance, a technology at the intersection of big data and machine learning. By implementing these solutions, companies can take a proactive approach to maintenance for improved uptime and production, enabling them to remain competitive. Food and beverage companies are already analyzing a great deal of data through sensors and HMI/SCADA systems. However, without context and analytics behind that data, it is of limited value. 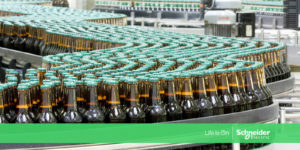 There are several advanced software solutions that food and beverage companies can use to support predictive maintenance. At a basic level, a data historian enables analysis of time series and historical data to determine the potential root causes of past failures, enabling operators to take proactive action to resolve these issues. The next level of maintenance maturity is condition-based monitoring, which is ideal when measurable parameters are good indicators of impending problems. In condition-based monitoring users pre-define rules, and rules violations automatically trigger a work order. For more mission-critical assets, predictive maintenance solutions use advanced analytical methods such as advanced pattern recognition and machine learning to identify problems before they become operational and provide early warning notifications. These solutions allow plant operators to diagnose issues and take action to resolve them long before they affect the business, increasing uptime. Because food and beverage manufacturers have typically already invested in a number of solutions to automate processes, companies should look at where there are gaps in efficiency to determine where they can add more value. Bringing in outside consultants to perform an Asset Performance Management (APM) assessment can provide important insights as well as a comprehensive action plan. For instance, companies that are already capturing information on critical infrastructure but which are still operating in a reactive framework, might consider implementing a condition management solution which uses rules-based logic to auto-trigger work orders in the EAM system. Companies that are further up the maintenance maturity pyramid should consider deploying predictive maintenance on high-cost, mission-critical assets. Hardware-agnostic solutions allow companies to build on top of existing investments without requiring an expensive rip-and-replace. Another potential option is to consider contracting with providers who offer remote monitoring services, enabling companies to experience the benefits of predictive maintenance while reducing total cost of ownership. By implementing predictive maintenance, companies can increase asset availability and reduce unscheduled downtime, improving production without requiring additional investments. Read my interview with Food Engineering to see how companies are taking advantage of these technologies today. Are you considering implementing predictive maintenance? Let us know your thoughts in the comments section.